What's Linda Cooking - Your Solution to What's for Dinner Tonight!! Your Solution to What's for Dinner Tonight!! I read cookbooks like novels. Is anyone else like me? But I tend NOT to follow recipes! Can anyone else relate? I was flipping through an Emeril Lagasse cookbook Essential Emeril and saw a recipe for Roasted Pork and Roasted Potatoes. It reminded me of how my Mother In Law makes her Roasted Chicken with Potatoes. It has the same reddish color. Then I thought back to a family cookbook that I picked up from the Dollar Tree. 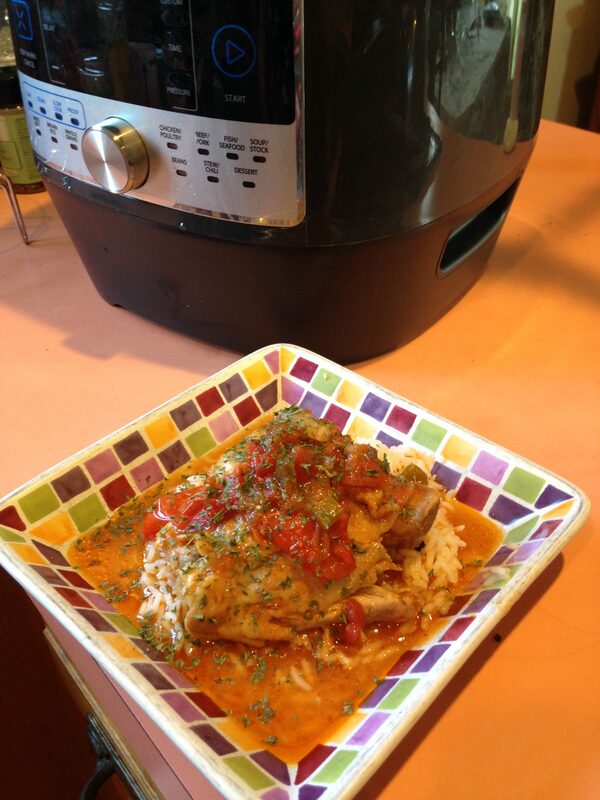 I do not have it anymore, but I remembered a recipe for roasted chicken pieces with a red pepper sauce that was amazing. So, thinking back to how I made the original chicken/red pepper sauce recipe (totally relying on memory…always a precarious situation!) and the new recipe which called for hot peppers, I constructed a new recipe or adapted recipe. My family does not like hot peppers, so that was totally out. And, being that I am a thrifty cook, I used what I had on hand. A leftover red pepper from testing another recipe and a Pork Roast that I had in the freezer when our local Price Rite had them on sale for $.99/lb. Yup, $.99/lb. So, this was going to be a “Use It Up and Use What You Have” recipe. Throwing ingredients into my Manual Food Processor, I got to work making a marinade. The red pepper, fresh garlic cloves, white balsamic vinegar (just because I like it), olive oil, parsley, salt and pepper. I pureed it into a nice thick marinade. My 2 lb (more or less) pork loin was in a freezer bag and slightly still frozen (just a little). I added my peppery concoction to the freezer bag and marinated that (hopefully) delicious roast for about 4 hours while the roast finished defrosting. 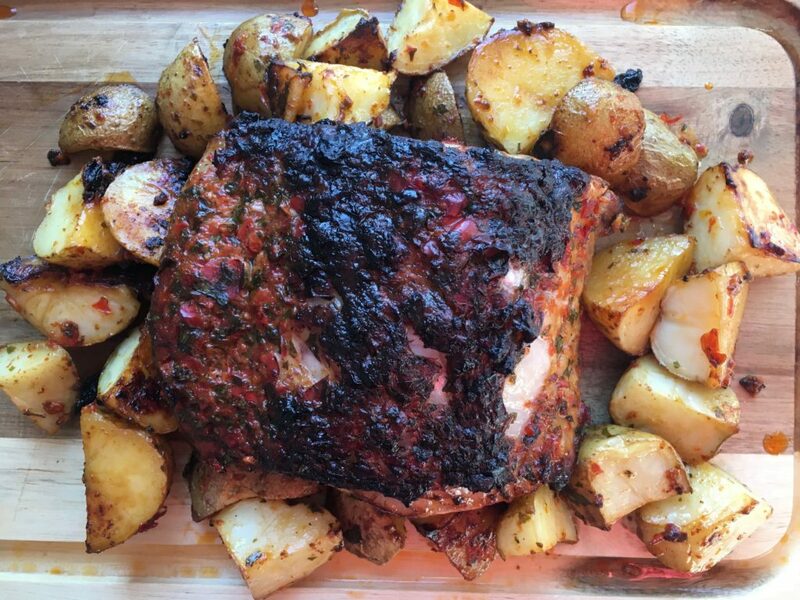 When cooking time came before my hangry hungry family arrived home, I quartered some skin-on washed potatoes, nestled the pork loin into the center of my Rectangular Baker and tossed the potatoes with some of the dripping marinade. In the oven it went on 425 degrees for about 20 minutes then down to 350 for the remaining 30-40 minutes until the meat thermometer read 140 degrees. Rested for 15 minutes and then sliced up. So delicious! I served it on my Wooded Cutting Board because I love to carve the meat on a carving board and I think it looks so beautiful. Plus, why put it on a platter and dirty another plate! Yes, I will make this recipe again. So here is my new concocted recipe! Cut diagonal lines into the fat of the pork loin roast. In the food processor, puree the red pepper, garlic, white balsamic vinegar, olive oil, parsley, salt and pepper to taste. If it is a little too dry, add a little more vinegar or oil to taste. Pour marinate over pork. Marinate the pork loin for 2-3 hours or overnight. Quarter potatoes and put into a 9 x 13 Rectangular Baker. Place pork loin into the center of the pan. Pour remaining marinade over the potatoes and mix them up so the potatoes are also covered with the marinade. Bake at 425 degrees for 20 minutes. Then, reduce temperature to 350 and bake for about 30-40 more minutes until the internal temperature of the pork reads 140 degrees. Take the pork out of the oven, cover and let rest for 15 minutes before slicing. If the potatoes need longer to cook, while the pork is resting, continue to cook the potatoes until the pork has rested and sliced. Serve and enjoy!!!! Let’s just say, I am a mess when I cook! And I wonder why no one tells me before I go on camera that my black top has cooking stains on it from cooking for 30 people before the camera starts rolling! Yes, that’s me for the world to see (well, maybe 2 people who actually watch)! Maybe, just maybe, I need to start wearing an apron. I have about 20 aprons from my 21+ years and counting with Pampered Chef. Well, I can’t do anything about it now…it’s on ORCTV, Vimeo and Youtube. Still an embarrassment to my daughters…you’re welcome, girls! 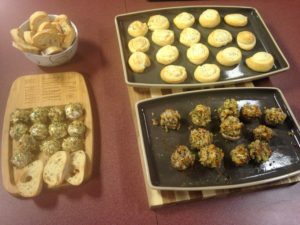 This month, I made something super easy at my cooking class for the Council on Aging because I had just come back from a week long family cruise to the Western Caribbean. We had a wonderful time but I got home and to bed around 2 am the morning of my class. So super easy and super fast menu this month was a must. Plus, I set the menu 2 weeks before. I normally have an idea of what I am making basing it on the sales and time of year. But, I had to set this menu somewhat blind because I needed to know what I was cooking further in advance. I love sandwiches and hearty salads. No just lettuce and dressing for me. I want some goodies in my salad…like beans, avocado, corn, peas, croutons, cheese, carrots, eggs, olives… When I was on Weight Watchers with my friends, their lunch salads were always 0 or 2 points…mine were always 8+. This Southwestern Salad appeals to me because of the extra stuff (corn, olives, avocado and a very creamy doctored up ranch dressing. I adapted the recipes a little because there were no ripe avocados in the stores where I shop. So, I just used prepared guacamole. It made it simpler and faster to make but I like the flavor of my own guac better. If you want to see the video, here it is on Youtube Southwestern Salad & California Wraps. You can also see it on Vimeo. 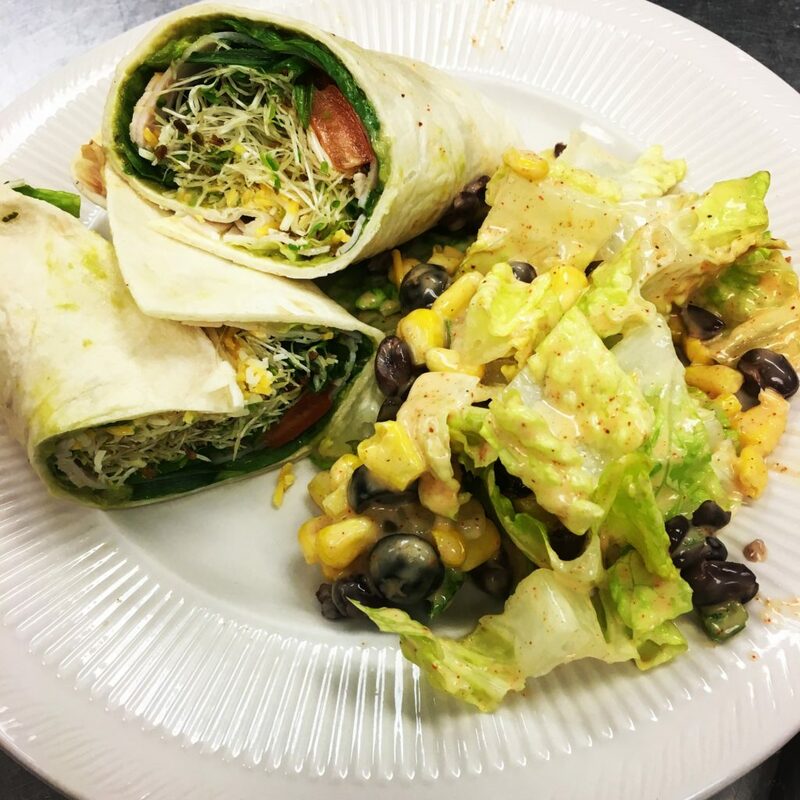 Links to the recipes are: Southwestern Salad and California Wraps. I hope you enjoy these recipes. Our guests at the Council on Aging loved them and went back for seconds. There was nothing left! I’m in love with linguica! And pasta, of course but let’s talk about linguica. If you don’t know anything about linguica, where have you been? And where do you live? I’m fortunate to live in an area with a huge Portuguese population…my husband and kids are from Portuguese descent. So, yes, I cook some Portuguese meals and the cuisine has had a huge influence in my cooking. I often substitute linguica for Italian sausage in many recipes. Cacciatore is one of those recipes where linguica shines when substituted for Italian sausage or chicken. Luckily when I present my cooking classes for the Council on Aging, the audience shares my appreciation for linguica (and most of what I cook, especially since they are eating it for lunch)! This recipe with a simple salad is easy and delicious! I hope you make and enjoy this meal. 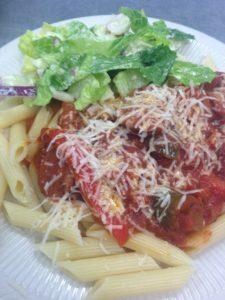 You can view my complete What’s Linda Cooking show for Linguica Cacciatore by clicking on the link. Enjoy! In large skillet saute onions, peppers and mushrooms and garlic in olive oil over medium heat for about 3 minutes. Slice linguine into 1 inch pieces and add to pan. Add tomatoes, puree, stock, paste and seasonings. Cover and simmer for 20-30 minutes. Boil pasta in water until al dente. Drain.. Add cacciatore mixture over pasta and serve with parmesan cheese. Join my VIP group on Facebook for recipes and deals! Thanksgiving is over and the holiday season has begun. You may be like me, you get invited to a few parties and host your own parties or holiday gatherings at your house. I host Thanksgiving and Christmas at my house along with a few other get togethers thrown in…just because! Appetizers are my favorite part of any gathering. In fact, I like to host just cocktail/appetizer/pickings parties. Last Christmas, I hosted…again, and I decided that only appetizers would be served. Nothing that required a fork and/or knife. I even used paper plates…say it ain’t so!!! Oh my goodness, did I just put ain’t down in writing?! I never say that non-word, let alone write it! My kids would be shocked! But they won’t read this! Anyway, here are a few very easy appetizers to help you make your gatherings easy and yummy! And here is the video of What’s Linda Cooking for ORCTV. The staff loved all the appetizers and they were gone…very quickly! Enjoy! Chop ham, green onions and mix with cream cheese. Make into balls with scoop. Roll in chopped pecans. Refrigerate until serving. Do not separate dough into triangles. Gently press or roll seams to seal, but do not flatten. In small bowl, mix cream cheese, parmesan cheese, and rosemary. Roll up dough from the long side. Slice into 1/2 inch rolls. Please pinwheels flat onto cookie sheet or baking stone. Bake 12 – 15 minutes or until golden brown. Take stems out of mushrooms. Chop mushroom stems and onions. Sauté until soft with minced garlic and butter. Add bread crumbs, Italian seasoning and parsley, salt and pepper to taste. Arrange mushroom caps on baking sheet. With small scoop, fill mushroom caps with bread crumb mixture. Bake at about 400 for about 15-20 minutes. I don’t know about you but the side dishes for many holiday or everyday dinners are my favorites. 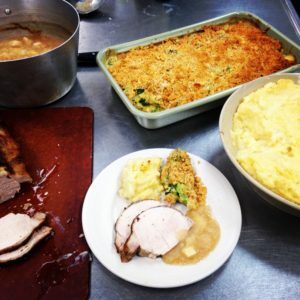 There is nothing like homemade apples sauce, broccoli au gratin, mashed potato casserole (just one of my favorites), homemade cranberry sauce and so much more. When eating my holiday diner, I have very little of the “main” dish meat on my plate but a lot of the sides. Frequently, I put a little bit of every side on my plate and then go in for seconds of my favorites. We have some tried and true sides that we always must have for our holidays. It seems mashed potatoes (I think there would be a revolt if we did not serve some sort of potato), always make an appearance at holidays but also many times at our family dinner table. But, why not have some of these special sides for your everyday dinners? Isn’t every night/day you sit down to a meal with your family special? No matter how many times I serve roasted pork, homemade apples sauce is always a favorite accompaniment. And don’t even think about jarred aka non-homemade apple sauce!! It just does not compare. This month at the Council on Aging, I concentrated on side dishes. With the upcoming holidays, I thought it would be a welcomed segment. So, I hope you enjoy these side dishes. I know my family will this Thanksgiving and Christmas! Here is the link to the What’s Linda Cooking episode. I hope enjoy watching it as much as I did filming it and the seniors had enjoying this feast!!! YUM!!! Place peeled and cubed potatoes into a large pot with water to cover. Add salt. Boil until tender. Drain. Meanwhile, sauté onion in butter or olive oil. When onion is almost done, add minced garlic. Sauté for another minute. Add to potatoes and mash. Add chicken stock, butter and shredded cheese. Put into a large baking dish. If desired, add more cheese on top or buttered bread crumbs. Bake at 400 for about 20 -30 minutes. Steam broccoli until just tender. Put into a large baking dish. In a sauce pan, add butter until melted. Add flour and cook for about 1 minute. Slowly add about 1 cup of milk, whisking to incorporate. It will thicken. If too thick, add a little more milk. Take off the heat and add about half the shredded cheese. Stir until melted. Add cheese sauce to broccoli and mix until broccoli is coated. Melt about 1/4 cup of butter. Mix with a sleeve of crushed Ritz type crackers. Top broccoli with the cracker mixer and remaining cheese. Bake at 400 degrees for about 20 minutes. Peel, core and dice apples and add to a large sauce pan. Add a little bit of water, lemon juice and sugar.. Cook for about 20 minutes until apples are soft. Mash to desired consistency. Add cinnamon to taste. Yesterday I came upon an incredible deal on chicken legs…the package cost me $.50!!!! Combining a coupon with a good price of $1.09/lb chicken legs, the out of pocket price was only $.50. Score!!! Or should I say, TOUCHDOWN! But they only had 1 package of chicken legs and I have about 10 coupons. Raincheck, please!!! Instead of putting the chicken legs in the freezer, I opted to cook them right away. I’m channeling my friend Chris who does not freeze anything…just buys enough meat for the day or a few days. Okay, what happens when the bird flu comes and the stores close down??? I know, she’ll come to my house! She knows I’ll let her in! Back to the recipe, digging through my incredibly packed organized refrigerator, I spied some leftover tomato puree, check. Onions, check, check…oh wait, my daughter always complains about onions in her food. Should I put onions with their incredible flavor or not. NOT. I don’t want to hear it from her and I know I can get some deliciousness without the onion. And then some wine, check, check, check! I got down to business constructing our yummy meal, wine bottle glass in hand. With a meal like this, the chicken needs to be browned, even though the skin will soften up with the addition of liquid…mantra, browning means flavor. On the chicken went some salt, pepper, Italian Seasoning…the normal suspects in my cooking. In the pan, heating to a nice simmer was some olive oil and then the chicken goes in. There is nothing, I mean nothing like the smell of chicken roasting or sautéing on the stove top. Am I right or am I right? Just agree with me! 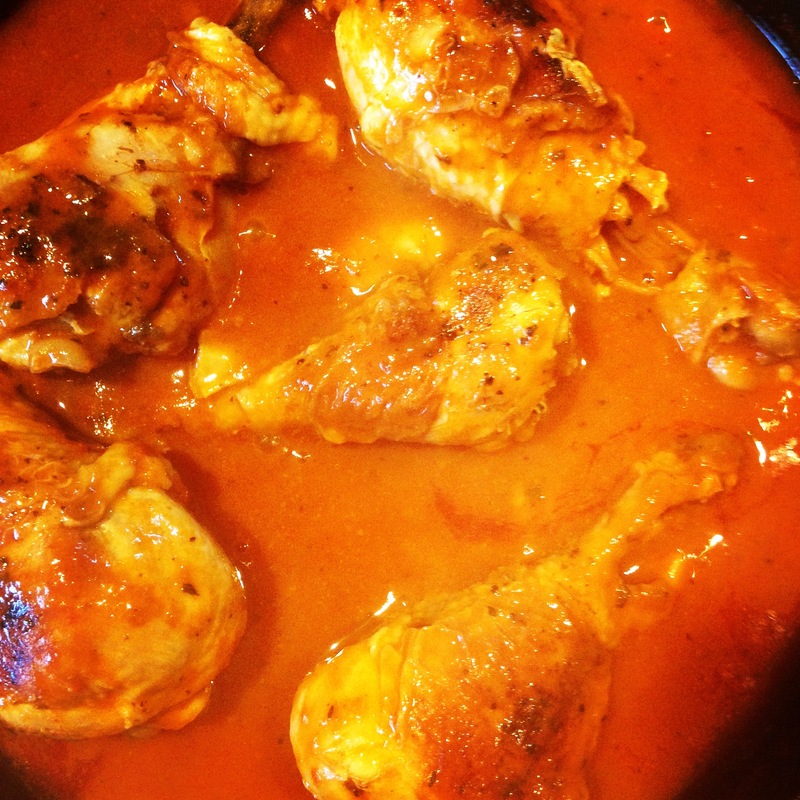 When the chicken was sufficiently browned on all sides, in went the tomato puree (about 1 cup) a pinch of red pepper flakes and about 1 cup of wine. This is where it gets a little dicey. I know I should have used red wine but I only had an expensive fabulous bottle of wine from Ocean State Job Lot. Yes, I said Ocean State Job Lot for $3.99!!!! And it was a white wine. In went the garlic. I don’t like to sauté garlic because I end up burning it, so I put it in with the sauce. On went the cover and the smells in my house went up another notch of deliciousness. It simmered for about an hour. Add some al dente linguini and perfectly toasted garlic bread and dinner was done. Another success in my kitchen. Well, maybe not…I was going to add some zucchini to make it a little healthier but unfortunately my zucchini had seen better days and ended up in the compost pile. Not so much of a win on that front. But the meal was fantastic AND the leftovers were packed up for lunches. That’s what we had for dinner. What did you make for dinner? As many of you know, for the past 10 years (+/-) I have been volunteering at the Council on Aging presenting a cooking class once every month. I try not to repeat recipes…especially now since for the past 5 years, ORCTV has been filming them. I can’t have my fans (LOL) seeing the same recipes!!! 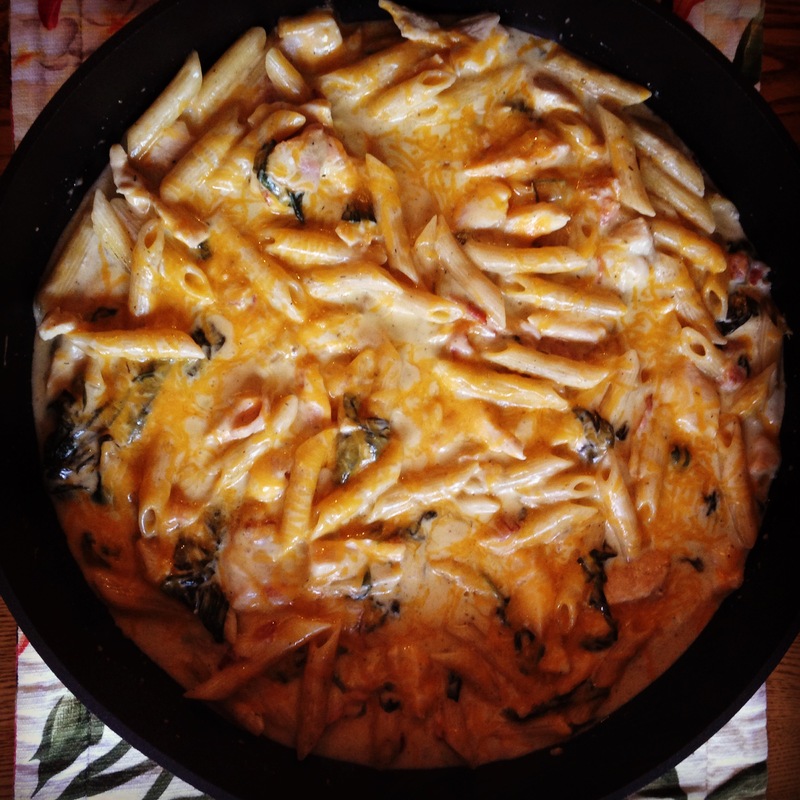 This month, I have been thinking about Buffalo Chicken Dip. We’ve had a few pool parties and it seems like I have been making this dip a lot. I mean a lot!!! I thought it would be great as a pasta dish but not so much with the buffalo sauce for the Council on Aging (Flashback to a sale on Hot Italian Sausage and eyes watering because it was too hot)! In 12-inch nonstick skillet, brown cut up bacon. Add cut up chicken sprinkled with ranch seasoning and sauté. Once browned, add cream cheese cubed and melt. Add 2 cups of water and pasta. Bring to a boil. Add spinach. Cover; cook over medium heat, stirring occasionally, 14 to 16 minutes or until pasta is tender. Remove from heat. Add 1/2 of the cheddar cheese and mix. Add the remaining cheddar on top. Let stand 1 to 2 minutes or until cheese is melted. Wowie Cake, Cocoa Vinegar Cake, Depression Cake…Whatever You Call It, It’s Yummy! My mother used to make what she called a Wowie Cake…we loved it! My kids also loved it because it has no eggs. Translation…no eggs = kids can lick the bowl and spoon without Mom worrying about salmonella. 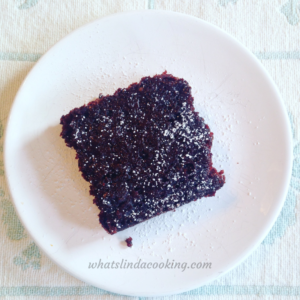 It’s one of those cakes that is so easy to make because it just has a few ingredients. Super moist and I have not met anyone who did not love this cake. My Uncle Johnny loved, loved, loved this cake! My mom would make it for him when he would visit. I make it for my father in law because he loves it just plan with a little powdered sugar sprinkled on top. My daughter loves it with chocolate or vanilla frosting. My niece just loves it because it’s vegan and she can eat it! I really have not met anyone who tried it and didn’t love it. Here’s the recipe for an 8 X 8 size. I love that size because in the summer, why, yes, I can make a cake in the toaster oven and not heat up the house. Just double the recipe for the 9 x 13 size or 2 layer cake. Enjoy!!! Whisk dry ingredients together. Add oil, vinegar, vanilla and water. Whisk well. Pour into a 8 “ square pan, Brownie Pan, CupCake pan or mini cup cake muffins. Bake at 350 for 15 – 35 minutes depending upon the size pan you use. Once cooled, dust with confectionary sugar. Is it too hot to cook? August is also the time that I get new products and recipes to test…normally these are typical “fall/winter” recipes. Recipes like, stew, slow roasted carnitas, roasted chicken…the type of cooking that I love to do. But, I don’t like to heat up my kitchen. Who would when your house is 90 degrees!!! This year is no different with the types of recipes. But, one big difference is we have the product I have been asking to add to the line for the past 20 years. A pressure cooker!!! OMG!! This is a game changer. And I have been loving cooking with it because I can cook all these slow roasted meals in a fraction of time but it does not heat my kitchen!!!! LOVE IT!!! Plus, I have been asking for this product for 20 years!!! They finally listened to Linda Medeiros!!! It’s about time! 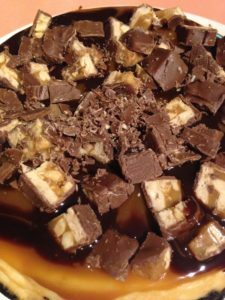 Not only have I been testing whole FROZEN chicken, beef stew, carnitas but also baking Caramel Chocolate Cheesecake (you are welcome, my family)!!!! Amazing! Not heating up my kitchen has been a wonderful thing. Cooking a frozen whole chicken in 45 minutes is a wonderful thing!! Cooking dried beans in 15-45 minutes without soaking is a wonderful thing!!! Oh, maybe I’ll make some Boston Baked Beans…just because I can! If you have a pressure cooker, what is your favorite thing to cook? This is the no recipe, recipe! 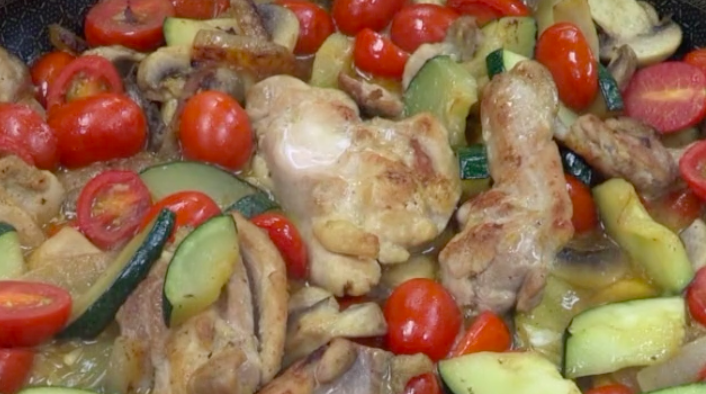 Although this recipe can be adapted for different meats and veggies, I ended up with chicken and zucchini in this dish because zucchini is plentiful this time of year and it’s plain yummy. There is no secret, I love chicken. It’s such a versatile ingredient and it’s inexpensive compared to other types of meat. Believe it or not, the day I cooked this recipe, I had a hard time finding boneless/skinless chicken thighs at a good price. I ended up going to 3 different stores…1 did not have any chicken thighs, 1 had bone-in thighs at a ridiculously high price and the 3rd had them with bone-in at $.89/lb. I went with the 3rd option and deboned the thighs. All the skin and bones went into my Quick Cooker for a chicken stock. I could have made this recipe with the bone in but at the Council on Aging, I need to be able to make the main meal in about 30 minutes, so boneless was the way to go. At home, I would have just gone with the bone in. As I mentioned in the video, I normally serve this with mashed potatoes which are my favorite (yum!!!) but I was feeling a little lazy and did not want to peel potatoes for 30 people (I know, I know…stop being so lazy!!!). So opted for rice. It did come out great with the rice but really would have been better with the potatoes. Well, here’s the recipe I adapted. By the way, if you do want one of my cool…amazing Non Stick Stainless Skillets which helps make an amazing pan sauce with easy cleanup, just click the link. Preheat the oven to 425°F . Heat the oil in a Stainless Steel Skillet or Stainless Non Stick Stainless Skillet over medium-high heat for 3–5 minutes. Season both sides of the chicken with salt & pepper. Place the chicken in the pan and sear for 4 minutes. Turn the chicken over and sear for 1 additional minute. Remove the chicken from the pan. Meanwhile, slice onion & mushrooms. Cut the tomatoes in half. Cut the zucchini into 1″. Add the onions, mushrooms, minced or pressed garlic and salt to the pan. Saute for 2–3 minutes, scraping the bottom of the pan to release the fond or little brown bits. Add the wine or chicken stock and dijon mustard. Simmer, uncovered, for 3–5 minutes, or until the liquid has reduced by half. Add the tomatoes and zucchini to the pan and stir to combine. Place the chicken on top of the mixture and bake for 12–15 minutes, or until the chicken in cooked. If you use bone in chicken, increase the baking time to about 30 minutes.